This wine is from Vinsobres, Southern Rhône, made by the Perrin family, better known for their Chateauneuf du Pape`s. Vinsobres is a tiny village which previously had a Côtes du Rhône village status, but in 2006 it was changed into it`s own AOC. Wines must be made from an equal mix of Grenache and Syrah(or Mouvedre). It`s vineyards are considered to be the most northern in the Southern Rhône area. 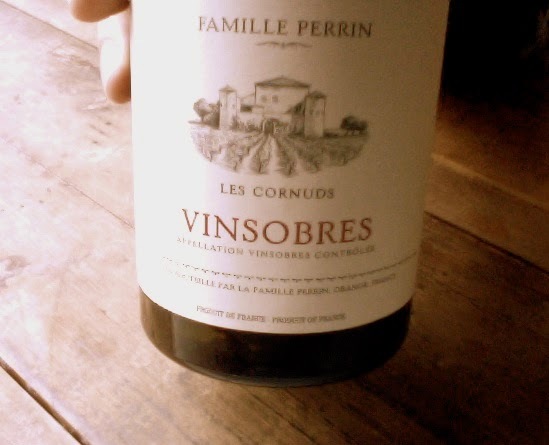 Famille Perrin - Vinsobres "Les Cornuds"
Has a subtle but elegant nose of ripe dark berries, white pepper, hint of oak, but not too much. On the palate this is surprisingly fresh and lively; with strawberries, fresh blueberries, hint of woodsy stuff and spices. Vinsobres is in the border of S- Rhône and N- Rhône, in a quite high elevation, and this is showing definitely here; Northern Rhône freshness meets Southern Rhône lushness. Strong mouthfeel, good acidity, and also quite big tannins, which indicates that this will age at least a good 5-10 years. Delicious aftertaste with earthy notes, pepper and strawberries. 14,5% Alc. is very well integrated. For the price, pretty damn delicious Rhône wine.